I'm not after it, just really curious as to what it plugs in to! An interesting question (and drive) - I'm not adding much, but perhaps it's for some MS-DOS or similar system of XT vintage, with the D-shell connector being data and the DIN plug being for power supply? totally a guess, but the external drive for a commodore 128D? True, that DIN plug does look like a Commodore serial connector, but then what's the D shell (Centronics-looking, I forget the technical name) connector for? Not Commodore. That DIN connector don't got enough pins. This is definitely for something more strange. 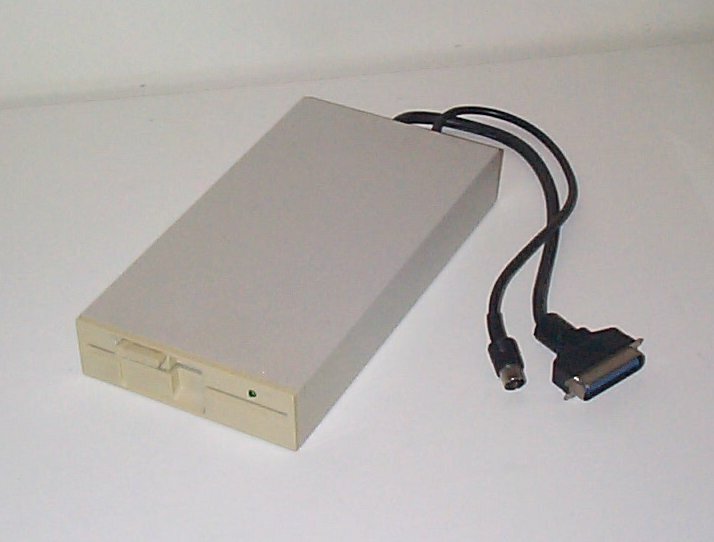 The question is, who used Micro Ribbon connectors for floppy drives? The DIN will be power; there's enough pins in the Micro Ribbon for a direct connection to the back of a 5.25" drive's controller. I'mma guess something like a BBC perhaps? I've got an external floppy drive with a similar Micro Ribbon connector and a strange, almost Molex QuickFit type power cable. True, it's really a guessing game! I didn't think the DIN looked quite right for a Commodore serial connector, but memory is vague on that. Besides, as mentioned, the other connector looks very parallel-data-ish. BBC is an interesting guess, but I can only remember them using different DIN plugs to this for various serialish things, whereas the drive connectors I remember were simple pin headers (e.g. http://en.wikipedia.org/wiki/Pin_header ). There could have been other BBC drive interfaces though (I think the Master is the one I'm remembering, but I had Model Bs as well). The mystery continues! I'm sure someone will recognise it eventually. Carcenomy wrote: I'mma guess something like a BBC perhaps? No. Acorn originally used a 34way IDC header on the motherboard to connect disc drives. Pretty confident the same went for the Master series, except for the Master Compact using a 'standard' 25pin D plug (like you would expect a parallel cable from the back of your real/old PC to use). The newer boxes (Archimedes) required extra buffer hardware for external drives, usually from third parties, and they were generally IDC style plugs too. Could be for the Amstrad 6128+ as it apparently has a 36pin female centronics port for the external disk drive. Not sure about the din though but it could be some sort of power connector especially as it only has 4 pins. Found it. It's from an Amstrad PC2386. This page shows the ports on the back of the machine. A bit of a rarity I would think. "I also have doubt as to why you would want to connect an external drive to this computer. I believe you would be able to fit two floppy drives into the machine itself." It's for a 5.25 inch drive, which won't fit internally. It is an interesting looking machine. I wonder if they still have it tucked away somewhere or if it is long since gone. acsi wrote: Could be for the Amstrad 6128+ as it apparently has a 36pin female centronics port for the external disk drive. Not sure about the din though but it could be some sort of power connector especially as it only has 4 pins. Wikipedia wrote: In order to simplify the EMC screening process, the edge connectors of the previous models have been replaced with micro-ribbon connectors as previously used on the German Schneider CPC6128. As a result, a wide range of extensions for the original CPC range is connector-incompatible with the 464plus and 6128plus. In addition, the 6128plus does not have a tape socket for an external tape drive. I had one of those PC2386s years ago. It was an interesting machine, easy to get to the parts you could modify, impossibly hard to get to anything more interesting. Looking for detailed images of the back of a CPC6128+ (which features a couple of micro ribbon connectors) I found this: http://www.jonathanen.com/pages/Help/Sideswitch+.jpg. The floppy connector on this model was a 36 pin micro ribbon ("Centronics") connector, so I'd agree with this being a 5.25" drive for a CPC6128+ - a pretty oddball combo, but I've also found links to articles on how to mod one for a 3.5" drive, so obviously people were/are doing whatever they can to avoid having to use those stupid 3" disks! The 4 pin DIN makes some kind of sense for power - +5, +12 and a couple of grounds, just like a molex.